Students these days, while glued to new technology, are craving nostalgia. Whether it’s watching movies from the 90s or digging up old Backstreet Boys albums, kids love a little nostalgia in their life. And what better way to do so than giving them a way to have pictures other than selfies and Snapchat? 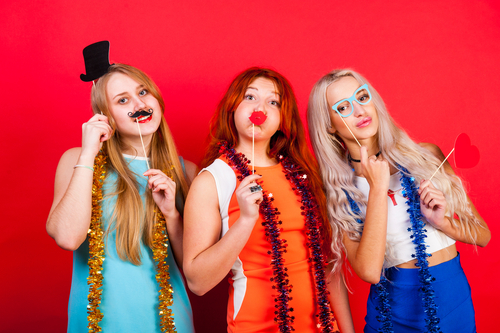 Any school event can be a bigger hit when you have a quality photo booth rental. Whether it’s a chance for couples to take a goofy photo at a dance or for students to show their team spirit at a football game, any school event can go the extra mile for fun. No matter where you need us to set up, we can take care of you and your students quickly and easily. Many schools wind up wasting money on party favors no one wants. But with a quality photo booth rental, your students are able to take away fun memories that they’ll cherish for years to come. From their best friend to their dorm mate, they can take a fun picture with whomever they’d like, and not a stuffy one in front of a wooden archway. Let your students take a fun picture the way that they want to each time. Call the best photo booth rental service in the Greater Toronto area! We’re there for you when you need us. When you use amateur student photographers, the quality of pictures taken are unreliable. And hiring a professional photographer could eat in to your budget big time. Don’t sacrifice quality for price; have an affordable photo booth rental delivered to your next event. We’ll even take care of the hard stuff for you by setting it up, manning it and fixing any maintenance issues you may experience, and then hauling it away at the end of the night. You won’t have to worry about it not working halfway through the event because we’re the most professional choice in the Toronto area. When you need photo booth rentals, you need us! Photo booth rentals for school events aren’t just for middle and high schoolers, either. College events are a great place to have a photo booth rental for any school event you may have. Whether you’re having a school pride week, a club meeting, or even setting up for the homecoming game, a photo booth is an easy way to let your students capture the day in pictures. Whether it’s a school dance or a pre-football celebration, we can even help you customize your photo booth rental. No other rental service in the greater Toronto area has the amount of personalization options to help make your rental what you need it to be. From customized photo backdrops to fun and silly props, we have everything you need to make your rental great! Go beyond the yearbook team and don’t waste money on an outside photographer; get everything you need from the best photo booth rental in Richmond Hill. Call us today to schedule your photo booth and make your school event fun!